Here are 5 free Firefox add-on to see Bitcoin price live. Using these free Firefox add-ons, you can easily see Bitcoin prices live and from various sources. 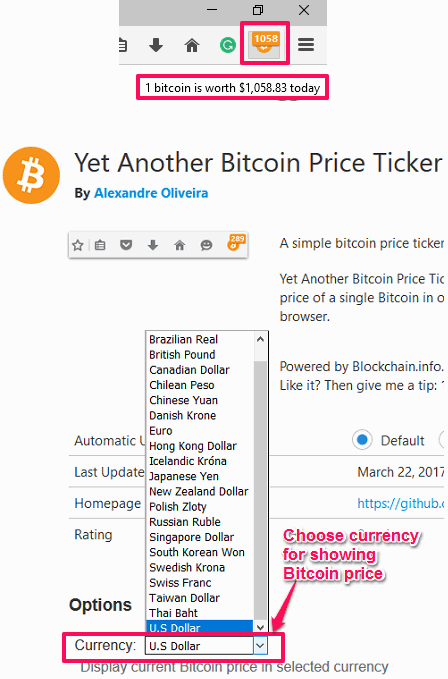 Some of these Firefox add-ons comes with features like Bitcoin price converter, Bitcoin wallet, Bitcoin toolbar, etc. Also, some of these add-ons only allow you to see Bitcoin price only; they are very simple. Earlier I talked about Bitcoin Price trackers for Chrome, and in this article I will talk about similar addons for Firefox. These add ons will let you see Bitcoin Price Live in the icon of the add ons. So, Live price of Bitcoin will always be in front of you. Previously, I wrote about Chrome extesnions to see Bitcoin prices, then I ralized why stop there. So, I decided to find the same for Firefox. So let’s start exploring this list of Firefox add-on to see Bitcoin price live. Bitcoin Price Ticker is a free Firefox add-on to see Bitcoin price live. It’s quite a powerful add-on to see Bitcoin prices as it supports multiple sources to fetch Bitcoin price data. Bitcoin Price Ticker uses a lot of sources to update live Bitcoin price including BitStamp, BTC-e, Coinbase, Kraken, BitPay, CoinDesk, BTCChina, and much more. It places a simple label at the top right side of the Firefox bar and you can add multiple labels as well. You can choose different currencies corresponding to the different sources from the long list of available options. Also, there are some customization capabilities available such as, you can change the refresh time interval, you can opt to see the Bitcoin ticker in the separate toolbar, change font size, avoid round figures on the labels, etc. It’s very simple to use this Firefox add-on to see live Bitcoin prices. First, grab it from the above link, then add it to your Firefox browser. After that, you will see various labels appear on the Firefox bar showing Bitcoin prices in different currencies. You can customize these labels using the Add-ons menu of Bitcoin Price Ticker. Open Bitcoin Price Ticker’s options window by pressing Ctrl+Shift+A. And, you will see a long list of currencies from different sources there. You can check one or multiple currencies from the list and you can also choose a color for the label. And, once you have finished choosing the currencies, you can return to the Firefox interface and the labels will be displayed ion the Firefox bar. The best use of this add-on is to see Live Bitcoin price in multiple currencies at once. Bitcoin Ticker Plus is another free Firefox add-on to see Bitcoin price Live. This add-on is quite unique in itself as it comes with additional features too. Not only Bitcoin price, but you can also add your bitcoin wallet to it and get notified about Bitcoin news and your Bitcoin transaction history. It can show Bitcoin price data from 5 different sources including Blockchain, Coinbase, Bitpay, and others. You can choose a separate currency for each source to display Live Bitcoin price by just hovering over its icon. Also, it comes with a Bitcoin converter feature that allows you to convert and see Bitcoin prices in other currencies as well. Apart from these, it comes with its separate toolbar whose visibility can be toggled. Additionally, you can generate QR code for your Bitcoin address and customize the color of fonts. Getting started with this Firefox extension is very easy. Just add it in Firefox using the above link and after that, you will see its icon will appear on Firefox toolbar. On hovering over its icon you will see the Bitcoin prices in tool-tip. And when you click on its icon, it will bring its interface, where you can customize various things. In the Converter section of its interface, you can convert Bitcoin prices in other currencies. There is a preferences section also given to customize the currency for each source, toolbar color, update interval, decimal places, and many others. Bitcoin Rate & Conversion is another free and quite simple Bitcoin Price tracker Firefox add-on. Using this add-on, you can see live Bitcoin price and convert it to other currencies. It offers Bitcoin price and conversion in only three currencies. Using this Firefox add-on, you can see Bitcoin prices in EUR, USD, and GBP. It shows the Bitcoin price at the top side of its interface as a label. There are no customization features available. After adding it to your Firefox browser, you will be able to see its icon on the Firefox toolbar. Clicking on its icon will bring its interface as a panel in which you can see the Bitcoin price on the top label. There is Bitcoin price converter also that you can use to convert Bitcoin prices in 3 currencies (USD, EUR, GBP). So, it was all about Bitcoin Rate & Conversion Firefox add-on to see Bitcoin price live. The add-on does what it promises and I like it for its simplicity. However, I really wish that developer would add some other features in coming updates. Bitcoin Venezuela is another very simple Firefox extension to see Bitcoin price live. It shows the live Bitcoin price right from its interface, which looks like a panel. It uses API of Bitcoinvenezuela to get the latest Bitcoin price updates. Bitcoin Venezuela adds its icon to the Firefox toolbar. And you can access it anytime you want. However, it only shows Bitcoin price in 3 currencies: USD, EUR, and VEF. Additionally, it comes with a Bitcoin calculator to convert Bitcoin price between the mentioned currencies. Using Bitcoin Venezuela is very easy. After you have installed it on your Firefox browser, you will see its icon on the toolbar. Click on its icon to bring its interface, where it shows the current Bitcoin price in various labels, corresponding to different currencies. A Bitcoin converter is also there on its interface which you can use to convert the Bitcoin price. Bitcoin Venezuela is quite a simple Firefox extension to see Bitcoin price live. It makes very easy to see live Bitcoin price and quickly convert to other currencies. However, the number of supported currencies are very few. Yet Another Bitcoin Price Ticker is again a very simple Firefox add-on to see Bitcoin price live. It shows the live Bitcoin price right from ts icon. Also, you can hover over its icon to see the Bitcoin price. It supports 15 different currencies to show Bitcoin prices. And it uses Blockchain.info to fetch Bitcoin price data. It’s pretty easy to use this Firefox add-on to see Bitcoin price live. After adding it to the Firefox browser, you can start using it. It shows the current Bitcoin price over its icon as a badge. You can also hover over its icon to see the Bitcoin price with more precision. 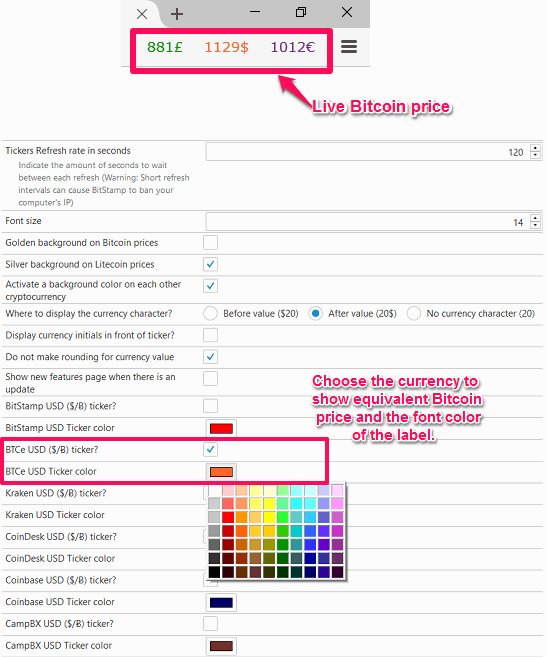 You can change the Bitcoin currency using the add-on’s options by pressing Ctrl+Shift+A. That’s all you can do using Yet Another Bitcoin Price Ticker. It was the last very simple Firefox add-on to see Bitcoin price of this list. The addon works very well and I liked it. All in all, it’s small and simple Firefox addon to see Bitcoin price live. These were some pretty awesome Firefox add-on to see bitcoin Price live. Using all of these Firefox add-ons, you can see Bitcoin prices in many currencies and also some of these add-ons comes with a Bitcoin converter to convert Bitcoin price in other currencies. Some of these add-ons come with very simple features and interface but fulfill the requirement of getting Live Bitcoin price.